« Are HDDs Vibration Sensitive? Are these two announcements related? Well, The SSD Guy thinks they are! Higher-RPM HDDs help to accelerate disk accesses by a small percentage while a hybrid can boost speeds significantly. According to Seagate, the new hybrids are: “Up to 5× faster than a traditional 5400-RPM HDD.” A hybrid offers a bigger speed boost while reducing the power requirements, since faster spindle speeds eat up a lot of power. The new hybrids come in two diameters: 2.5″ for notebook PCs and 3.5″ for the desktop. The 2.5″ drives are offered in two thicknesses – 7mm and 9.5mm. The 7mm 2.5″ hybrid gets past a difficulty encountered by Seagate’s prior offerings. The last generation of Seagate 2.5″ hybrids was only offered in a 9.5mm thickness which was too thick to find a home in today’s shrinking notebook PCs. Intel’s Ultrabook specification calls for the entire PC to be only 13mm thick, which leaves a scant 3.5mm for the housing and keyboard on either side of a 9.5mm HDD or hybrid. A 7mm version boosts that 3.5mm up to 6mm, which is a more manageable number. The thicker 2.5″ hybrid ships in a 1 terabyte capacity while the thinner one is limited to 500GB. A 2TB version of the 3.5″ drive has been announced. All of these products have 8GB MLC NAND caches, twice the size of the 4GB SLC flash in the earlier Momentus XT. 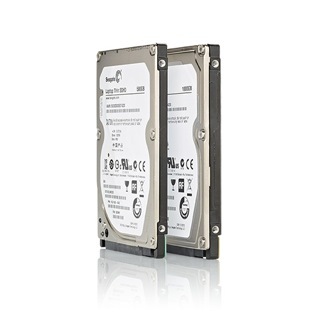 The 2.5″ drives are based upon a 5,400RPM HDD while the 3.5″ product maintains the 7,200RPM speed of the older product. Although this was not in the Seagate announcement, a Tech Report article reveals that the company has also upgraded its caching algorithms (which the company calls “Adaptive Memory”) to cache not only disk reads but to include writes as well, using a “Write Through” policy rather than the earlier “Write Around” version. Cache writes are a thorny problem which require some caution to implement. Since PC programs tend not to spawn many writes, Seagate was safe to put off write acceleration until the company was certain of its algorithms’ integrity. I happen to be bullish on hybrids since they offer the high capacity and low prices of a standard HDD with speeds approaching those of an SSD. Objective Analysis has published a report on this market: Are Hybrid Drives Finally Coming of Age? that can be purchased for immediate download from our website.